Where Is the Road? (The Good Samaritan, Trayvon, and Privilege) | Thought Required; Pants Optional. I preached this sermon today at Douglass Boulevard Christian Church. The context is important. I had written all but one paragraph of this sermon before the verdict came down in the George Zimmerman trial in the killing of Trayvon Martin. My sermon already made reference to Trayvon and to the case, and I ultimately made virtually no changes to what I said about the case in light of the “not guilty” verdict. Yet this sermon feels too theoretical and too wide-ranging in light of the utterly raw, sickening feeling the verdict induced in me and in many others, especially my friends of color. The tone felt, and still feels, off. Yet I share it here anyway in the hopes that you may find it of some use regardless. I suspect that when you read this familiar story, Jesus’s parable of the Good Samaritan, the first place your mind goes is the first place mine goes: German social theory. No? Just me, then? Well, bear with me for a little bit. Derek very kindly asked me to preach while he is representing Douglass and the GLAD Alliance at the General Assembly in Orlando, and I suspect that he knows by now that when you get me, you get social theory, for better or for worse. I hope it is for the better. So: The Good Samaritan. The story of the Good Samaritan is one of those passages from the New Testament that suffers from a kind of artificial familiarity, especially for us lifelong church goers. The man on the Jerusalem-Jericho road, the priest, the Levite, the Samaritan: Many of us hear about these personages from the time we are small children. They are, for Christians, constant companions. But that familiarity is, I think, a bit deceptive. It hides a tremendous historical distance between them and us. I think that the Good Samaritan remains a bit of a stranger to us. In order to get a handle on this historical distance, I find it helpful to consider the sociological theory of the German sociologist Max Weber. (This is the “German social theory” part.) Weber famously—and, I think, convincingly—argued that a hallmark of modern societies, and of the dividing line that separates the society of Jesus’s day and ours, was a social process he called “rationalization.” Rationalization, in Weber’s sense, doesn’t refer to “rationalizing” in the psychological sense of coming up with reasons for believing whatever you are dead-set on believing anyway. It is a very specific social process. Prior to modern times, Weber says, people’s social lives were predominantly shaped by social institutions like governments and religions whose authority was backed by the sheer weight of tradition or evidence of supernatural power. These institutions maintained their purchase on your life as an individual, their footprint in your daily life, by means of their association with exemplary people or things: charismatic individuals like prophets or priests, people singled out by their birth like kings. The sway of these institutions over your life was bound up with the efficacy and proximity of the things or people with which they were associated, as well as how those things or people were disposed towards you. Naturally, this state of affairs could render your life rather precarious, depending on how the powers that be—the god or gods, the priests, the king, the elders— feel about you: that is a matter that could literally change at a moment’s notice. Modern times, though, hit upon the notion of what Weber calls “rationalized” social institutions—that is, formal, impersonal social institutions explicitly established to remove important areas of life from the mercy of individuals’ whims and render them efficient, predictable, and dependable. Bureaucratic governmental administration tied to fixed geographical jurisdictions, offices, and standard decision-making procedures, rather than to the whims of a monarch or his agents, is a chief example of rationalization. Another is law enforcement and legal institutions aimed at universal, neutral applicability within the boundaries of a given territory. “We hold these truths to be self-evident.” “Natural unalienable rights.” We in the United States live on the other end of this process of “rationalization”: the institutions of our society are about as “rationalized,” as impersonal, efficient, and predictable, as any that have existed in human history. Naturally there is still some element of precarity that rationalization has still not eliminated; depending on who you are, you may be treated very differently in Maine than in Alabama. But to a large extent the law, and the basic values of equality, fairness, and neutrality embedded within it, is the same in both places. The story that we tell about the rule of law in our country claims for itself a kind of justification that is not tied to authoritative persons, to mythic events, to talismanic objects. It is instead tied to universal principles that apply equally throughout the country. I wonder, then, how many of us hearing this today can say that we understand what it means to dwell in, and be shaped by, a place like the area between Jericho and Jerusalem. I certainly cannot. It is not the neutral, undifferentiated space of rationalized, administered society. For starters, it is unclear exactly how and where it is bounded, or even by what name it should be called (and, as the first chapters of Genesis teaches us, naming is itself a form of bounding). It is a territory that, from Jesus’s day down to our own, has hovered uneasily between many boundaries and many names in many languages, each name the outcome of contested claims of authority: Judah. Roman province of Judea. Ottoman province of Syria. British Mandate of Palestine. Cisjordan. The West Bank. Then, and now, the Jerusalem-Jericho road is a place where one cannot avail oneself of universal, self-evident truths, of the unquestioned authority of institutions like police or courts. All of those things may exist in that place, but their grip on what actually comes to pass is tenuous and is bound up with conflict and difference. We modern Christians living in such a thoroughly rationalized society as that of the United States have a difficult time, I think, getting access to the sense of social and spiritual place at work in Jesus’s story. This is, to simplify a bit, because for us both sides of the road on which the man lies dying are pretty much the same. What separates us from the man is, spiritually speaking, nothing but our own individual motivations. The question we think this story is posing to us is: Am I the kind of person who wants to help, or not? When you put it this way, the priest’s and the Levite’s failure to help, and our own failures in similar circumstances, are just individual defects of their character, and the Samaritan’s actions are evidence of his individual virtue. In crossing the road to the man, the Samaritan crosses no boundaries other than that between his selfishness and his better, more charitable, nature. So, from our point of view, the lawyer’s question, “Who is my neighbor?” seems almost foolish, almost too easy to answer. Everyone is my neighbor, of course! Be more like the Samaritan! Or, if that doesn’t seem obvious, it is obviously true that, if anyone is my neighbor, then a man lying beaten and bloodied on the road across from me is my neighbor. If I don’t recognize that, then I have missed something blatantly obvious, like a child who was never taught that there are numbers greater than seven. But Jesus entertains the lawyer’s question as a bona fide one, no matter whether he was trying to “justify himself” or not; and in his story of the Good Samaritan, he is on to something important that is easy for us to miss. On the road from Jericho to Jerusalem, the line separating the man lying beaten and dying on the side of the road from the Samaritan is not just the line between selfishness and charity. It is the line between different identities, different social institutions, different ways in which their entire sense of who they are and what they are supposed to do is shaped. The man and the Samaritan occupy different worlds. And this road is where their worlds overlap and intersect. No wonder it would have been easier to pass by! Certainly the priest and the Levite, people we might expect to see the man as their neighbor, find it easier to pass by, not to dirty their hands. But the Samaritan, “moved by pity,” crosses that road. In doing so, he puts himself at great risk. Luke’s Greek that the New Revised Standard Version translates as “moved by pity” is the single verb splangkhnizomai, a word that is related to splangkhnon, the word for the “inward parts” of a person or an animal—its lungs, its kidneys, its liver, its heart. It is a visceral, elemental sort of emotion, far more than a mere transient emotion of pity. Aside from the parables of Jesus, the Gospels and early Christian literature tend to reserve this word, this gut-level kind of compassion, for God and for the divine, Messianic mercy that Jesus himself exhibits. Here, Jesus says, even the Samaritan can step out of his world and embody divine mercy. In doing so, the Samaritan puts his own security, his own identity, on the line for the sake of the other, his enemy. This is what makes what he does different than charity. In charity my own identity is not put in question. In charity, I remain an unquestioned do-gooder, my status as benefactor reinforced, my identity put plainly in the center of things. But the Samaritan puts himself at the disposal of the hurt man—all he has, all he is, guts and money and all. In doing so, Jesus tells the lawyer, tells us, that the Samaritan embodies the life of the age to come. He embodies, in every sense of the word, salvation. Salvation comes to the man on the road in the shape of, of all people, a Samaritan, someone he would previously have refused to recognize, would perhaps have not even been able to see. And in the encounter, both the Samaritan and the man are transformed, from mere identities to agents of their own lives. The God towards which Jesus points transforms us, moves us across roads, through and across identities, beyond boundaries, towards the liberation of the age to come. It is easy for us to tell ourselves that the kinds of boundaries that separated the man from the Samaritan in first-century Palestine, the sources of the tremendous risks he took, have been suspended or removed. In fact, some of them have. Our modern, rationalized society, a society of autonomous citizens, of free markets, of public order premised on individual rights and equal justice for all, has removed some of those boundaries, or at least displaced them. In fact, as Max Weber saw early on, Christianity had its own role to play in that “rationalization” process, especially in the origins of capitalism in Europe. As we “progressive” Christians like to remind the world, the values of liberal societies—toleration, equality, universal respect—are Christian values. Rationalization as a tendency in modern life is itself a product of Christian Europe. Is there anything left for Christians to do, then? Has the “life to come” towards which Jesus pointed us actually arrived? Don’t we now live in a flat world? Isn’t the playing field level? Is there really a road anymore dividing man from Samaritan? I think there very much is. The problem we have today is the same problem of the priest and the Levite: We do not look, we don’t want to see what is on the other side of the road, we pretend the other side of the road doesn’t even exist. But there are plenty of people—our own neighbors, in fact—who walk, and live, and sometimes lie beaten and half dead, on the other side of this road to which Jesus points. In some cases, we, and others like us, put them there. The notion that both sides of this road are the same, that the same order and values hold sway over there as do here, is a fiction that is encountered more on one side of this road than the other. The supposedly neutral, fair space of rationalized, administered society is better understood as the space of specific, identifiable forms of unearned social privilege from which some of us benefit more than others. As Orwell put it, all animals are equal, but some are more equal than others. Truth is, the space of “equality” and “justice for all” is nowhere close to neutral. The world is not flat. Our country isn’t even flat. Supposedly “neutral,” “fair” space in our country is a lot more neutral and fair if you look and act a certain way. It is white space; it is male space; it is straight space; it is the space of a certain sort of thin, able body. I come out with a great deal of social privilege. Being white and male and having advanced degrees puts me, more often than not, on the cushy side of the street. But others are not positioned so fortunately. What they know, from daily experience, is that offenses against the privilege boundaries of our social spaces are policed in our own time with ruthless vigilance, often as brutally and as violently as any geographical or political boundary. 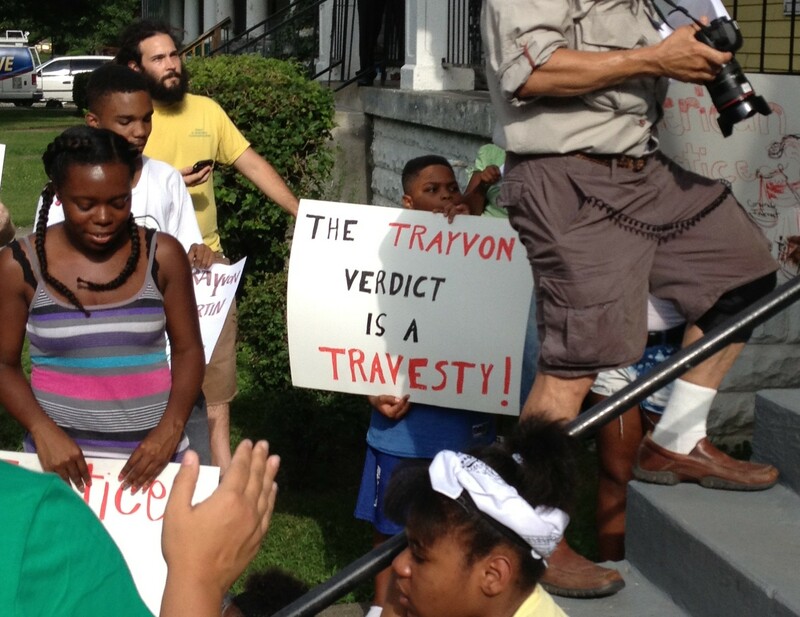 Take the killing of Trayvon Martin: Martin’s cardinal offense seems to have been his daring to transgress in presumptively white space, Skittles and iced tea in hand, without being sufficiently apologetic and deferential to its prerogatives. George Zimmerman, for his part, policed the whiteness of that space, in the absence of any legal authority to do so, moved by nothing more than the notion that black youths are inherently dangerous invaders in that space. Zimmerman crossed that road, not to help, but to reassert the neutrality and safety of white space for white folk. And, as last night’s verdict goes to show, our supposedly neutral, color-blind justice system sent the message to him and to those who would act like him that what he did was just fine. Another group that has lived at the margins, of society and of the church, in that precarious space on the other side of the road, are our lesbian, gay, bisexual, transgender, and queer brothers and sisters. Society and the church has relegated us to the other side of the street for a long time, and in many cases left us beaten or dead. This is especially true of our transgender brothers and sisters, who face unspeakable rates of discrimination and violence just for being the people God is calling them to become. Like the Samaritan, though, we LGBTQ folk also have gifts to give to the church, if only because we and our stories are something the main currents of the church so long sought to deny, to erase, to rule out of bounds, to render invisible. This week the General Assembly of the Christian Church (Disciples of Christ) considers a resolution, co-sponsored by this congregation, to make our denomination “a people of grace and welcome to all,” and to affirm the “spiritual gifts of all Christians regardless of their sexual orientation or gender identity.” It is, if the resolution passes (and I hope and pray that it will! ), be a good start. We have far to go, and many more people and stories to embrace and to weave into our way of living in community, but we are moving in the right direction. May God give us the ability to persevere and to venture out, to make the struggles of we LGBTQ folk the struggles of the church. The lawyer asked, “Who is my neighbor?” We Christians today ask ourselves the same question. Jesus, though, implicitly tells him—and us—that we are asking the wrong question. The law and the prophets could have told him, and us, just fine who our neighbor is. Instead, the question Jesus invites us to live into is, “Where is the road? Can you even see it? And, once you find it, what side of it are you prepared to walk on?” Are we going to float over the world and its problems on hovercraft shoes, stopping here and there to sprinkle charity where and when we deem the recipients worthy and the circumstances advantageous? Or are we prepared to be moved, bone and guts and all, on the bare earth to the other side of the road? We may be shocked by what we find there: struggle, ridicule, possibly even our own deaths. No matter who we are, crossing that road comes with risks. But it is only in going over there, Jesus tells us, that we are going to find salvation, and justice, and the life to come. This entry was posted in Uncategorized on July 14, 2013 by bcubbage.